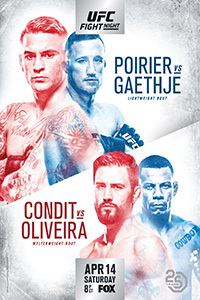 UFC on FOX 29: Poirier vs. Gaethje took place April 14, 2018 at Gila River Arena in Glendale, Arizona. • Dustin Poirier vs. Justin Gaethje: Dustin Poirier def. Justin Gaethje via TKO (punches) at 0:33 of Round 4. • Carlos Condit vs. Alex Oliveira: Alex Oliveira def. Carlos Condit via submission (guillotine choke) at 3:17 of Round 2. • Israel Adesanya vs. Marvin Vettori: Israel Adesanya def. Marvin Vettori via split decision (29-28, 28-29, 29-28). • Cortney Casey vs. Michelle Waterson: Michelle Waterson def. Cortney Casey via split decision (29-28, 28-29, 29-28). • Muslim Salikhov vs. Ricky Rainey: Muslim Salikhov def. Ricky Rainey via KO (punch) at 4:12 of Round 2. • John Moraga vs. Wilson Reis: John Moraga def. Wilson Reis via unanimous decision (29-28, 29-28, 29-28). • Krzysztof Jotko vs. Brad Tavares: Brad Tavares def. Krzysztrof Jotko via TKO (punches) at 2:16 of Round 3. • Gilbert Burns vs. Dan Moret: Gilbert Burns def. Dan Moret via KO (punches) at 0:59 of Round 2. • Dhiego Lima vs. Yushin Okami: Yushin Okami def. Dhiego Lima via unanimous decision (30-26, 30-26, 30-26). • Arjan Bhullar vs. Adam Wieczorek: Adam Wieczorek def. Arjan Bhullar via submission (omoplata) at 1:59 of Round 2. • Matthew Lopez vs. Alejandro Perez: Alejandro Perez def. Matthew Lopez via TKO (strikes) at 3:42 of Round 2. • Patrick Williams vs. Luke Sanders: Luke Sanders def. Patrick Williams via unanimous decision (30-27, 30-27, 29-28).